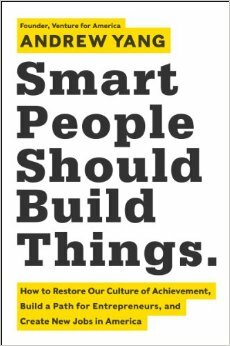 We couldn’t be more excited for our founder, Andrew Yang, to publish his first book, Smart People Should Build Things, in early 2014. In Smart People Should Build Things, Andrew lays out where our talent is going, how one develops as an entrepreneur, and discusses possible solutions (including Venture for America!) for the problems in our human capital markets. Check back between now and the February 4th release date for more excerpts. You can also pre-order your copy today at SmartPeopleShouldBuildThings.com! Take me, for instance. I wasn’t very enterprising when I graduated from Brown in 1996. I had a general desire to be smart, accomplished, and successful–whatever that meant. So I went to law school and became a corporate attorney in New York. I figured out I was in the wrong place after a number of months working at the law firm. I left in less than a year and cofounded a dot-com company, Stargiving, which helped raise money for celebrity-affiliated nonprofits. It was extraordinarily difficult. My company failed spectacularly, but I recovered. I went to work for a mobile software company, Crisp Wireless, and then a health care software company, MMF Systems, over the next five years, eventually becoming the CEO of a test-prep company, Manhattan GMAT, in 2006. That “good job,” in this scenario, is a job that requires a lot of complex analytical thinking and pays well, like investment banking or management consulting. If a student takes a professional route, becoming a lawyer, doctor, accountant, or dentist, he or she will need additional years of special training to develop professional skills and judgment–all very attractive to high achievers. There’s another view of the current system, though–that it’s a mess. Ambitious college students have no real idea what to do upon graduation, but they’re trained to seek the “next level.” Many apply to law school, grad school, or even medical school because of a vague notion of status and progress rather than a genuine desire or natural fit. Those who try to do something independently often find themselves frustrated by their lack of rapid advancement, and so default to a more structured path of law school, business school, or graduate school. The concentration in professional services leads our national university graduates to congregate in a handful of metropolitan areas–primarily New York City, Silicon Valley, Boston, and Washington, DC. Those who become bankers or consultants are highly paid and heavily socialized, yet many become disaffected due to a lack of purpose an unsustainable lifestyle, and some simply discover they don’t enjoy their roles. We train thousands more lawyers each year than legal jobs exist for, and hundreds more academics than there are academic jobs. Each path throws off waves of refugees who are often at a loss as to what to do with themselves, only at that point they’re in their late twenties, possibly in debt or used to an expensive lifestyle, and trained to do something narrow and specific. The book “Smart People Should Build Things” makes a basic argument. If year after year we send our top people to financial services, management consulting, and law schools, we’ll wind up with the pattern we’re already seeing: layers of highly paid professionals working astride faltering companies and industries. But if we send them to startups, we’ll get something else. Early-stage companies in energy, retail, biotech, consumer products, health care, transportation, software, media, education, and other industries would have a better chance of innovating and creating value. Even allowing for a certain amount of failure, we’d create hundreds of new companies and tens of thousands of new jobs over time. Our economy and our country would be better off. Our communities’ tax bases would go up, shoring up our ability to pay for schools and long-term development. We’d restore our culture of achievement to include value creation, risk and reward, and the common good. By solving this one problem, we solve many other problems at the same time.